Other Products: White Cardstock, Glue Gun. Zig Clean Color Real Brush Markers. Instructions: Card size 5"x7" (Tent Fold). On the top fold adhere partial medallion die from Frame A Card Leafy Borders Die. On the top flap of the card adhere pattern paper from the collection. Distress the edges of the pattern paper before pasting the pattern paper. Now cut one Eyelet Lace frames die and adhere it on the top of the pattern paper with Designer Dries Clear Adhesive as shown. Now stamp scroll image with archival ink and cut with the matching die from Silent Night Scroll Stamp and Die as shown, color them with Zig Clean Color Real Brush markers and sprinkle crystal clear glitter. 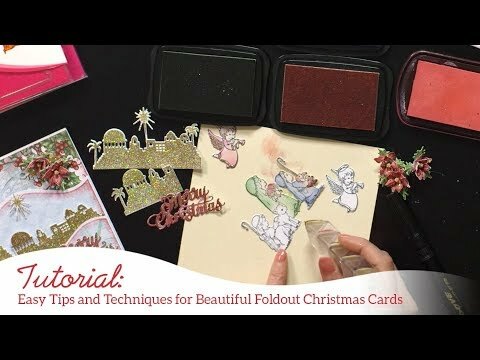 Now stamp and color some Poinsettia & Holly Clusters and cut them with matching die and shape them with 3D Poinsettia Shaping Mold. Create some flowers and then add stamens at the centre of the flowers and sprinkle some crystal clear glitter. Next stamp one holy family with shepherds from O Holy Night Cling Stamp Set with archival ink and cut them with matching die and color them with Zig Clean Color Real Brush Markers and gold stamp paint and add some crystal clear glitter. Arrange all these elements as shown. Next add one die cut from Intricate swirl frames die and distress the edges and adhere it with foam tape to give some dimension. And now add the sentiment cut from the paper collection.